In 317/18 A.D. a series of commemorative issues was struck by a total of six different mints in the Roman Empire. The series honored three dead and deified emperors: Claudius II Gothicus, Maximian and Constantius I. To all of these three, the reigning emperor at the time, Constantine the Great, had familial connections. The series comprises little bronze coins which are very collectable and offer the collector a wide range of interesting issues to ponder on. In this article I will take a close look at them. Firstly, I will describe and comment on the different types. Secondly, I will try and look beyond the coins to answer the question why these coins were issued at all, and why these particular emperors were honored. 1 Obverse: Veiled and laureate head of the deified emperor. 2 Obverse: Veiled and laureate head of the deified emperor. 3 Obverse: Veiled and laureate head of the deified emperor. The series consists predominantly of half folles, measuring 15 mm in diameter. Only the mint in Rome struck the slightly larger full follis (18 mm) and only with the ‘emperor seated’ type (figure 1). The obverses show the veiled and laureate bust of the emperor being honored. The fact that he is veiled – and not just wearing his laurel wreath or his radiate crown – signifies that the emperor concerned is dead and deified (The honor of deification, which was given by the Roman senate, meant that the dead emperor was awarded a personal cult with a temple and an order of priests). The veiled bust marks the last stage in the portraiture of deified emperors; previously the emperor was portrayed radiate or bare-headed. On some obverse dies a little fibula is discernable, holding the emperor’s robes together. The obverse legends identify the emperor depicted, which is very convenient because the portraits do not differ much in style. Each emperor is called ‘divus’, the traditional title of a dead and deified emperor. Although the notion of all three emperors being ‘the best’ at the same time may seem peculiar to us, the ancient Romans were not too concerned about this. ‘Optimus’ and ‘maximus’ were honorary titles that could be bestowed and borne just like any other. The pattern of the honorary titles designed for each emperor is uniform. All titles consist of a noun and an accompanying adjective (‘optimus imperator’, ‘fortissimus imperator’ and ‘pius princeps’). The shortest forms of obverse legends that we find in Rome imply that SEN belongs to ‘Maximianus’ (we encounter: DIVO CLAVDIO, DIVO CONSTANTIO and DIVO MAXIMIANO SEN). The addition of SEN makes perfect sense and is as to be expected. The use of the abbreviations for senior and junior (SEN and IVN) in coin legends is the established way to distinguish between two emperors of the same name, ruling at the same moment in time. The mints evidently felt it was important to clarify the elder Maximian was intended and not the younger Maximian. This younger namesake, known to us by the name of Galerius – some coins call him MAXIMIANUS IVN – died in 311 and was also deified. Confusion of the two was a real possibility and so it had to be made clear that Constantine’s adoptive grandfather was subject to the honor and not the other Maximian. The reverses of the series show more variations than the obverses. As I mentioned earlier, there are three different types. The type most frequently encountered by collectors is the following. On this reverse type the honored emperor is depicted seated on a curule chair. He is holding a small scepter and, as on the obverse, he is veiled. The curule chair (sella curulis) was a backless chair, Etruscan in origin. It was used by the highest magistrates of the Roman state (consuls, quaestors and aediles, also called the ‘curule magistracies’). On the coinage it symbolizes the power the emperor has, or in the case at hand, had. The scepter is another symbol of power, imperial and divine. The reverse legend accompanying the type reads REQVIES OPTIMORVM MERITORVM, which translates as ‘the rest/retirement of the best and most meritorious [emperors]’. These emperors of course being Claudius II, Maximian and Constantius. There is something worth mentioning here, namely that the legend, stated in plural, does not match the single seated emperor depicted. The legend only makes sense when it is applied to the whole series of coins of the three emperors together. This is quite unique in Roman coinage: the average Roman citizen, who happened to read the legend of, for example, the Claudius specimen, had to search his purse to find out who were the other ‘best and most meritorious’ emperors. 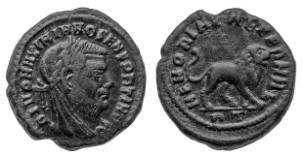 The two remaining types of the issue, struck for each of the three emperors, were only minted in Rome. The first of the two is the traditional coin type for dead and deified emperors: the eagle. The eagle is of course sacred to Jupiter, the supreme god of the Roman pantheon. On coins, the bird signifies the ascension to heaven of the dead emperor in order to become a god. The eagle is depicted in two different ways: head left and head right. The third and last reverse type of the series depicts a lion. This is not surprising for a number of reasons. Just like the eagle belongs to Jupiter, the lion belongs to Hercules (this is made clear by the fact that the club of Hercules is added to the design of some coins depicting the lion). Jupiter and Hercules were at the center of the Roman emperor cult. A few decades earlier Diocletian and Maximian had claimed each of these gods as their personal patron and the two imperial ‘houses’ ruling the East and the West were perceived as Jovians and Herculians. It is certainly true that this system was no longer working by the time the coins considered here were minted, but the two gods must have still been on everyone’s mind. Furthermore, just like the seated emperor on the curule chair holding a scepter emphasizes his power (once as a mortal, but now as an eternal god), the animals also symbolize power. Since the beginning of time the lion is considered to be the master of the earth, just as the eagle is the lord of the skies. The legend accompanying the eagle and the lion is MEMORIAE AETERNAE, indicating that the coins were struck ‘to the eternal memory’ of the deified emperors. Why were the coins minted? The emperors honored by the coins discussed above were, as I stated in the introduction to this article, relatives of the reigning emperor, Constantine. Constantius was his father, Maximian his adoptive grandfather and Claudius II his ancestor. I will now focus on why these coins were minted at all, and why these three particular emperors were honored. The primary reason for Constantine issuing these coins probably is political propaganda: Constantine tried to legitimize and consolidate his power by turning to his distinguished family tree of famous imperial relatives. But some observations have to be made to add some nuance to this rather one-sided statement. Firstly, in this period of time, the real basis for imperial power was the support of as many legions as possible. No one could become (and stay) emperor solely based on his ancestry, no matter how many distinguished forebears he could boast of. On the other side, the Roman legions did value the concept of hereditary imperial power. This was perhaps one of the major reasons why Diocletian’s tetrachic system (in which the next ‘Augustus’ was chosen based on his personal merits, rather than on his descent) failed: after the death of Constantius in 306 A.D., his legions applauded his son Constantine as the new emperor, circumventing the rightful successor, Severus. In other words, Constantine did not require an extensive line of famous forefathers, dressed in purple, to ‘legitimize’ his imperial power. He had his legions to serve that purpose. But it certainly did not hurt his position to stress his descent from ‘the best emperors’ the Empire had known, emperors who became divinities also. Certainly this would not have fallen on deaf ears as far as the legions were concerned. Lastly, it would not be fair to attribute the order to issue these coins to political propaganda alone. Constantine, apart from being a ruthless politician, was very aware of the divine world, and more specifically, of divine wrath. The issue can also be seen in this perspective. ‘To honor thy father and thy mother’ was one of the commandments of the Christian God, and the coins were issued after Constantine’s conversion to Christianity. Moreover, this idea of respecting and honoring one’s parents was also one of the most important virtues of the Romans. It was called ‘pietas’ and the issue of commemorative coins can be seen as a ‘pious’ act (As to this the Historia Augusta relates that Antoninus Pius got his surname because he had deified his ‘father’, the emperor Hadrian). The last issue I would like to discuss is: why these particular emperors? The choice of Constantius is obvious. He was Constantine’s father. However, the choice to include Maximian in the series is perhaps a little peculiar. To say that Constantine and Maximian had not been on the best of terms is an understatement. Just before his death in 310 A.D., the old emperor Maximian, who had been living at Constantine’s court in Arles since his second abdication, raised a rebellion against Constantine. He was proclaimed ‘Augustus’ for the third time, confiscated the imperial funds and took the city of Marseilles. However, his adoptive grandson laid siege to this city and after it fell, Maximian committed suicide. Until 310 A.D., Constantine had laid stress on his connection to Maximian, but now he found himself in a precarious position, being responsible for the death of the illustrious ‘senior Augustus’. The sources show that in the immediate aftermath of Maximian’s rebellion, Constantine turned to another ancestor (who happened to be Claudius II) and did not mention Maximian for a while. However, a few years later his name reappears in Constantine’s lists of ‘glorious predecessors’, perhaps because Constantine wanted ‘inaccurately, to demonstrate the “clemency” with which he had treated Maximian’. And so, in the issue of coins dated 317/18 A.D., Maximian was included. As mentioned above, after the unfortunate demise of Maximian, Constantine decided to proclaim a descent in which his adoptive grandfather had no part. This forefather was to be Claudius II Gothicus, and the claim is expressed for the first time in the sixth panegyric of the Panegyrici Latini, dated 310 A.D.: ‘For an ancestral relationship links you with the deified Claudius, who … destroyed on land and sea huge numbers of Goths’ (VI.2.2). The interesting part is that this claim is entirely fictitious. However, this proved to be no obstacle to the fact that Constantine’s ancestral ties to Claudius became accepted history within years. A number of sources mention the descent, but they differ in the details of the family tree – something that might be expected considering there were no grounds or records to prove the assumption. Several inscriptions imply that Claudius was Constantine’s grandfather. Eutropius writes Constantine descended from the daughter of Claudius. The Historia Augusta claims he descended from Claudius’ brother. Why did Constantine choose to invent a famous ancestor? It has to be said that he certainly could use a renowned ancestry. His father Constantius came from a rather humble background and, according to some sources, his mother Helena had been a lowly bar maid when Constantius married her. There even seems to be some doubt that Constantius and Helena were married at all at the time of Constantine’s birth. But why Claudius? Why not Aurelian (270-275 A.D.) or Probus (276-282 A.D.), who were two famous emperors at the time? That was exactly the point: they were too famous: ‘Aurelian held the power for five years, Probus for six. Too much was known about them.’ Then why not the rather obscure emperor Tacitus (275 A.D.)? Not a good candidate either because of the opposite: ‘No evil was reported [about Tacitus], and nothing much else.’ It was useless for Constantine to claim descent from an emperor, albeit a respectable one, but with no military glory attached to his name. The choice of Claudius was a logical choice because of ‘a combination of his fame as a destroyer of Goths [he acquired a victory over the Goths at Naissus] … and his short reign: conveniently little was known of him’. I would like to add one other consideration Constantine might have had in picking his fictitious ancestor: the imperial forefather had to have been deified. To emphasize descent, not from a mere mortal, but from a god was an important instrument of imperial propaganda. It had been done before on numerous occasions. For example, the first Roman emperor Augustus proclaimed to be the son of ‘Divus Julius (Caesar)’ on his coinage, while Hadrian proclaimed to be the son of ‘Divus Trajanus’ and the grandson of ‘Divus Nerva’. Constantine did the same: the divinity of Claudius as Constantine’s ancestor was an important thing to lay stress on, which is shown by the fact that it is emphasized time and time again in the sources. As stated above, to choose Claudius was a logical choice. He was the only emperor at the time (1) about whom sufficiently little was known, (2) who had no living relatives who could question the claim, (3) who had a reputation for fame on the battlefield, and (4) who was deified after his death. Possibly around the same time Constantine proclaimed his descent from Claudius, his rival emperor Licinius traced his lineage back to the emperor Philippus (only attested in the Historia Augusta: Gord. 34.5). Perhaps this claim was not successful because Philippus does not match the preceding profile as neatly as does Constantine’s choice of Claudius. Let us take a closer look at what the Historia Augusta has to say about the family tree of Constantine’s ancestor, the emperor Claudius. It is interesting to see the writer of this ancient account inserts a number of names in his biography of Claudius that are clearly taken from the family of Constantine. First of all, the nomenclature of Claudius, known from coins and inscriptions to be Marcus Aurelius Claudius, appears in the Historia Augusta as Flavius or Valerius Claudius. Clearly, these names appear because Constantine’s father was named Flavius Valerius Constantius. Furthermore, the (invented) brother of Claudius, the brother that Constantine allegedly descended from, is called Crispus. This is obviously a name that was chosen because Constantine’s eldest son bore that name. Furthermore, the alleged grandfather of Constantine (married to the daughter of ‘Crispus’, named Claudia) is named Eutropio. This is another invented name inspired by the fact that Constantine’s sister was named Eutropia. Lastly, the Historia Augusta reports that Claudius also had a sister. At this point, it will come as no surprise to the reader to find this sister is called Constantina. What all this indicates is the following: the claim of descent from Claudius was not meant for Constantine alone. It was primarily meant to serve his family, or more specifically, his sons. The claim was made for the purpose of founding a new imperial dynasty. That is why it is no coincidence that the commemorative issues were minted in 317/18 A.D. This year also saw the elevation of Constantine’s sons to the rank of caesares as well as the birth of his third child, Constantius, named after its grandfather. It can be said that the year 317 A.D. signifies the foundation of the dynasty of Constantine: with the new caesares it showed the promise of imperial rule in the future, while at the same time, with the famous ancestor Claudius, it was rooted in the past. Although his son and namesake was also proclaimed caesar in 317, the emperor Licinius could have read the signs. Constantine would not approve of another emperor ruling next to him. When he ultimately defeated the Licinii in 324, the imperial dynasty of Constantine would rule the Roman Empire alone. No longer the future emperor was chosen based on his innate abilities, like Diocletian had in mind when he founded his tetrarchic system. A new imperial dynasty was established by Constantine, and with it, the Empire saw the return of heriditary imperial power. Photos courtesy of Brent Upchurch. The coin illustrated in figure 2 is from my own collection. 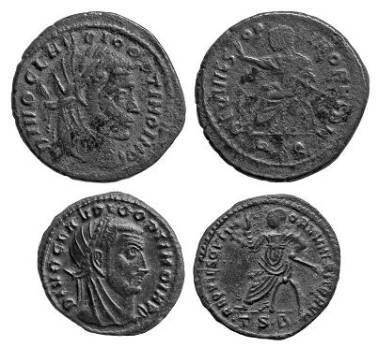 Failmezger, V., Roman bronze coins, from paganism to christianity 294-364 A.D., Washington D.C. 2002. Grant, M., The emperor Constantine, London 1993. Nixon, C.E.V. and B. Saylor Rodgers, In praise of later Roman emperors. The Panegyrici Latini, Berkeley and Los Angeles 1994. Southern, The Roman Empire. From Severus to Constantine, London 2001. Syme, R., “The ancestry of Constantine.” in Historia Augusta Papers, Oxford 1983: 237-253 (Reprinted from Bonner HAC 1971 (1974) 237ff). Warmington, B.H., “Aspects of Constantinian propaganda in the Panegyrici Latini.”, TAPA 104 (1974) 371-384. I would like to thank Annelies Nijboer, Dirk Boersema, Jim Phelps and Brent Upchurch. This article can also be read at www.forumancientcoins.com (Resource Section). Rome (RIC 104-128), Siscia (RIC 41-46), Arelate (RIC 173-178), Treveri (RIC 200-207), Aquileia (RIC 21-26) and Thessalonica (RIC 24-28). Refer to RIC for technical matters like dating, weights, legend breaks et cetera. The mints of Arelate and Aquileia provide variations to this theme. Thessalonica and Treveri stick to ‘optimus imperator’. For this statement, and the importance of military support to an emperor cf. Pat Southern, The Roman Empire. SHA Had. XXVII, cf. XXIV.5; Pius II.5; Dio Cassius LXX 2,1. 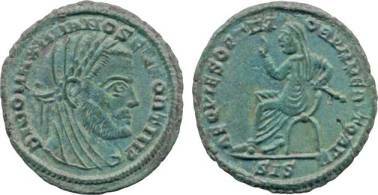 ILS 699, 723, 725, 730, 732 (calling Constantine ‘divi Claudi nepos [grandson of the deified Claudius]’, dating from the time of Constantine to the reign of his sons); Eutropius 9.22.1; SHA Claud. 13.2f. Other sources mentioning the descent are Anonymus Valesianus 1.2 and the apostate emperor Julian who, significantly, called himself Flavius Claudius Julianus (Or. 1.6d-7a, 2.51c; Caesares 313d). Quotations from Syme (1971) 70. See the comment by Nixon & Saylor Rodgers on the sixth panegyric, In praise of later Roman emperors: 220. Constantine was born in Naissus, the town where Claudius’ victory over the Goths, still famous in the days of Constantine, took place (Grant, M., The emperor Constantine, 27). Interestingly, roughly at the same time Constantine’s descent from the deified Claudius was proclaimed for the first time (310 A.D., in the sixth Panegyric), Maxentius, ‘usurper’ in Rome, issued a series of commemorative coins proclaiming his connections to the divine world. In the series, minted in Rome and Ostia, he proclaimed to be the son of a god (‘divus Maximianus pater); the relative and brother-in-law of a god (‘divus Constantius cognatus/adfinis’); the son-in-law of a god (‘divus Maximianus [Galerius] socer’) and the father (!) of a god (‘divus Romulus filius’). For the coins, see RIC (Rome) 244, 245, 255, 256 and RIC (Ostia) 25, 26, 28, 28A, 29, 30, 31, 32 and 33. Ultimately, all these ties to the divine world were useless against the army of Constantine, who defeated Maxentius in the famous battle at the Milvian Bridge in 312 A.D. The name ‘Flavius’ appears in SHA, Claud. VII.8; Aur. XVII.2, ‘Valerius’ appears in Claud. XVIII.3; The family tree of Claudius can be found in Claud. 13.2f.